Specialising in a vertical market can be an effective way of competing in a crowded managed services market. Yet, it’s not an automatic choice. According to a recent survey, some two-thirds of MSPS don’t ‘verticalise’. We consider the pros and cons – and set out 10 questions you need to ask yourself if you’re thinking about taking a vertical market focus. Given today’s highly competitive market and the commoditisation of managed services, it is increasingly difficult for MSPs to differentiate their offering and compete profitably on a technical level. You can try to gain a competitive edge by becoming an expert in a particular technology or by moving into a new service area – into security, for example, but where you go others will inevitably follow. So it’s worth considering another route to differentiation: compete at a business level, rather than on a technical level. Build up a real understanding of the world in which your customers are operating; work alongside them to help resolve the specific issues they face; speak their language even – let’s face it, every sector has its own jargon! Seek out the vertical that would give you the best opportunity to stand out from generalist competitors, in return for the investment you make. In recent years, a small number of verticals have been the focus for an increasing number of MSPs. 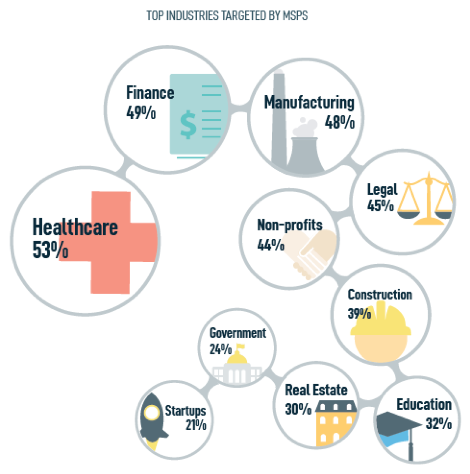 The chart below, from Datto’s State of the MSP Report, highlights that more than half of MSPs interviewed (53%) focus on customers in healthcare, with just under half targeting finance (49%) and manufacturing (48%). But sometimes even the verticals can become crowded. It’s interesting that an increasing number of MSPs are now refining their focus still further by developing a ‘niche within a niche’ or ‘micro-vertical’. Examples include IT services for veterinary hospitals (healthcare); hedge funds (financial services), and clubs and resorts (hospitality), according to survey results from Channele2e. This may be because the wider vertical is becoming too competitive – or that a particularly lucrative niche has been identified within it, where the requirements are so standardised that services can be highly tailored yet delivered at a relatively low operational cost, delivering higher margins. Customers are more likely to have confidence in you as a trusted adviser; see you as the ‘go-to’ expert. This should translate into stronger, longer-term customer relationships. You are more likely to be able to compete on value, rather than be forced to compete on price. This means higher margins. As customers broadly share the same requirements, you can standardise your service offering and develop new services more cost-effectively: you don’t have to constantly reinvent the wheel. This keeps your operational costs down. Marketing and sales can be highly targeted – you can send highly tailored messages to a specific audience, helping to reduce your cost of sales. Word of mouth referrals in your chosen market are more likely. You face a higher barrier to entry than operating horizontally. Be prepared to make a significant investment in really understanding the market and any vertical-specific technologies associated with it: patient billing and medical records systems in health-care or CRM systems in financial services, for example. Beware compliance. It can be extremely challenging in some markets – HIPAA springs to mind. On the one hand, compliance is an opportunity (SMB healthcare organisations need help with implementing and managing the technology essential to be HIPAA-compliant and so this is a way in for you) – but it can be an onerous responsibility. And you’ve absolutely got to get it right. Your MSP business will become dependent on the fortunes of that specific market – and may suffer from any downturns that occur. At what stage should you ‘go vertical’? If you’re just setting up your MSP business, should you start out with a vertical focus? Some MSPs I have spoken to feel that if they were to start out again they would certainly do so as a niche specialist. But would that mean turning away business outside of your vertical market in those crucial early stages? That would be a difficult thing to do! That’s why many MSPs starting out opt for a horizontal market approach, combined perhaps with a regional/local focus given often limited resources. What if you are an established MSP operating horizontally and then decide to focus on one or more vertical markets? This can be risky. You need to be sure you have the specialist knowledge necessary – or be prepared to acquire it very quickly. And what do you do with existing customers who fall outside your selected market(s)? Sometimes, the move to vertical happens coincidentally, rather than as the result of a direct strategy. One of our own MSPs did not set out to be a health-care specialist – his business just grew that way. Don’t forget, word of mouth referrals is an important driver of growth in a vertical, so once you have built up a clump of customers, your fame will tend to spread. If you are focussing on a single market, you can also develop a closer network with influencers. Then again, some MSPs may feel they have to go vertical. You may be operating in an overcrowded market, all offering the same commodity services – and finding it increasingly costly/difficult to tailor and deliver services across vertical markets. However and whenever you arrive at a vertical market strategy, you need to be sure it’s the right approach for your MSP business. Is your own background in a specific market or profession, so you have existing knowledge and networks that you can leverage? Do you currently have a preponderance of customers in a specific vertical market? Have you identified a vertical market that is currently underserved by MSPs – or is undergoing significant changes that are driving the need for extra help? Can the organisations you have in your sights afford your services: do they have the budgets? What can you offer prospective customers in this vertical that other MSPs can’t? Are you prepared to widen your geographical spread to feed the vertical focus if necessary? (Cloud and remote monitoring obviously make this easier). Can any of the business skills/understanding you have built up in delivering services to one vertical market be transferred relatively painlessly to another which has similar requirements? Healthcare and legal have much in common for example. Are you prepared to make the significant initial investment in acquiring specialist expertise b- and also in keeping it up to date? Changes in requirements for compliance, security, BDR, data protection and so on occur frequently in some verticals. Are your staff comfortable with the change to a vertical focus? After all, you don’t want then to jump ship at such a critical stage. What you do with existing customers who fall outside your selected market(s)? If the answers to the above questions are positive – you need to work out a strategy to move from a business agnostic to vertical specialist position. The summary below is a taster. As you head off into a ‘vertical sunset’, don’t forget to let people know: staff (who should already be aware), existing customers – and all those prospective customers in your selected market. In the latter case, run marketing campaigns to promote and reinforce your new focus. ‘Going vertical’ does not work for every MSP; indeed some wouldn’t even consider it. But if you’re delivering services across multiple markets, competing on price and seeing your operational costs rise while your margins fall – it’s worth investigating further. Contact us to find out how partnering with Inbay for NOC can free up your time to focus on a vertical market strategy.